We are big fans of Fred and Far‘s instagram account, especially their self loving check-lists. We launched the Propose Too initiative to empower women to propose back or first. Fred and Far reminds us that you should propose to yourself too. Don’t ever forget to commit to love yourself. 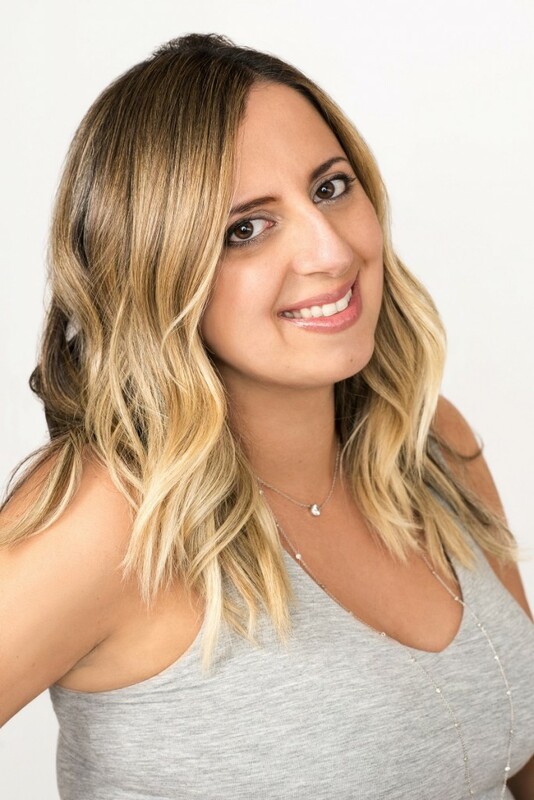 Melody Godfred is the founder of the Self Love Pinky Ring Movement, an entrepreneur and a happily married mother of two… among many other things. Thank you so much Melody for taking the time to answer some of our questions! I believe you are married with children, was your proposal traditional? I got engaged in 2009 and have been married since 2010 (what feels like a lifetime ago!). It was a Saturday morning in January, the first clear day after a gloomy week. My then boyfriend suggested we go on a hike. When we reached the top, he dropped to one knee and proposed with a ring he had picked all by himself. I was stunned. I had no idea a proposal was coming. I joke all the time that I’m glad I didn’t fall off the mountain. We now have three kids – Stella and Violet (twins, 6) and Theodore (6 months). Why do you feel women through every stages of their life need to be reminded that they need to self love? The relationship you have with yourself is the longest and most important relationship of your life. It’s also a relationship that gets very little formal attention. Despite all the years of education I received, no one ever told me or taught me to love myself… which is why this movement is so important to me, especially as a mother to two girls. I believe if self love becomes part of the conversation early on, girls can avoid a lot of the pain and discomfort that comes with adolescence. As women, we’re changing, evolving, growing… all the time. Consistently knowing yourself, and taking care of and loving all versions of yourself, requires commitment. That’s why for me, the Self Love Pinky Ring is so important. I created it when I had lost touch with myself, and had forgotten how to discover and tend to my needs. Now that I have my pinky ring, I’m reminded on a daily basis that I deserve the love and attention I give to everything and everyone around me. I’m also reminded that I’m never alone, because Fred and Far is a movement and sisterhood of women around the world who are not only committed to self love, but are committed to each other. I love your check-lists and I believe they are very popular. Real talk, are you always able to follow your own advice? I don’t always take my own advice. I’m not perfect, nor do I strive to be. The goal of the challenges and the content we promote isn’t to suggest that anyone is capable of achieving it all – self love, self care, self awareness, self worth – all the time. The goal is to create habits and a lifestyle that makes these values a priority, and on that level, I definitely take and live my own advice. But do I get all 30 self love challenge prompts done each month? Definitely not. I will say this though: the more I do them, the better I feel. How important is your husband’s support in your journey to Self Love? My husband’s support has been essential, along with the support of all the other people who play a role in my daily life. When I start to slide back into my old habit of putting myself last, they step in and remind me that I deserve to take time and space for myself and my needs. When I started Fred and Far, I wrote a very intimiate piece about my marriage and self-love journey for The HuffPost called, “How Self Love Saved My Marriage.” A lot of people couldn’t believe my husband was okay with me sharing the details that I shared. He urged me to publish it and to start this self love movement. He was and always has been my greatest advocate. Our relationship is based on seeing each other as we are, and supporting each other. I’m grateful to be with someone who isn’t constantly trying to change me. Tell us about the pinky ring. How did you come up with the design that features a trillion center? And decide that it should be worn on the pinky finger. When I set out to design the Self Love Pinky Ring, I wanted every aspect of it to have meaning. The design heavily features the inverted triangle, which is also the logo of Fred and Far, because it is an ancient symbol of the divine feminine. I believe that by wearing this symbol, women can tap into their inherent power as women. 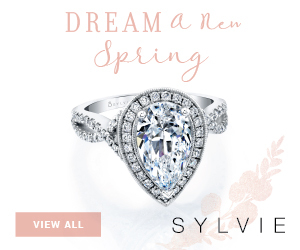 You’ll find this shape in the trillion gem, in the shape of our prongs, and in the cutouts in the basket of the ring. 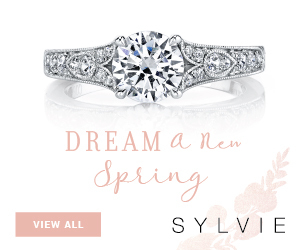 Before I created this ring, the only ring I wore that had a meaning associated with it was my engagement ring, which is worn on the ring finger and symbolizes committing to another person. I wanted the Self Love Pinky Ring to be just as instantly recognizable, so it was important for me to wear it on a dedicated finger that usually doesn’t have a ring on it. The more I’ve researched the pinky the more appropriate it becomes as the symbol for our self love movement. Without the pinky, our hands would lose 50% of their strength. So while it’s often overlooked, it’s incredibly powerful. Not to mention the history of the pinky promise (pinky swear), which is also a key part of our brand. When you make a pinky promise, you’re making a promise you know you won’t break. It’s important that self love is something that is treated with that level of commitment. I designed the Self Love Pinky Ring to be as bold as an engagement ring so that it would draw the same level of attention and be just as important. I’m extremely proud that after only two years, the concept is widely recognizable. 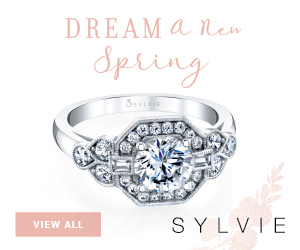 Now, when you see a woman wearing this bold pinky ring, self love immediately comes to mind. It’s unmistakable. 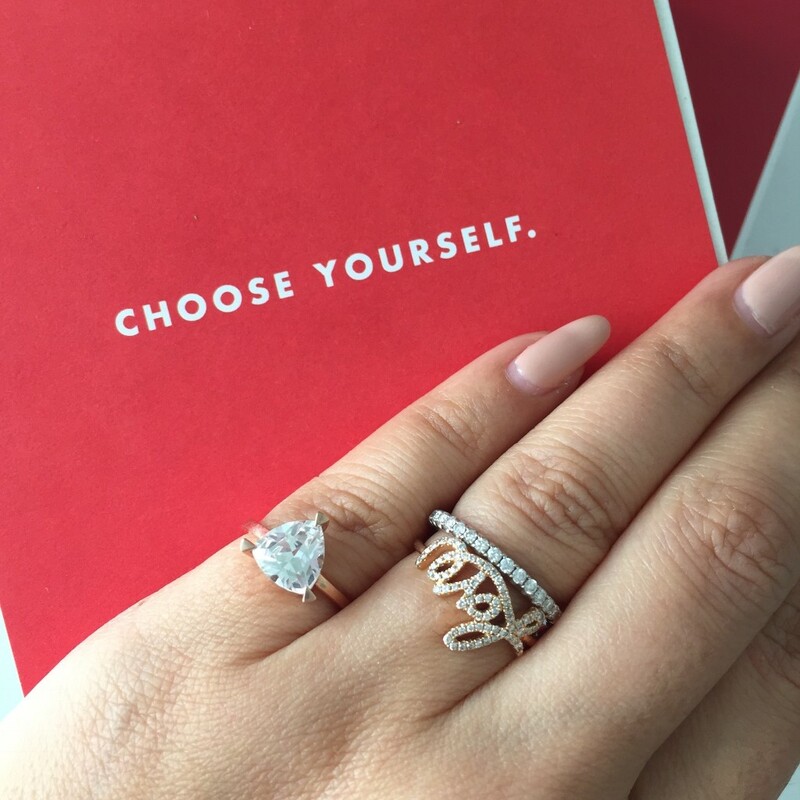 With the Self Love Pinky Ring, we’re changing the conversation around what it means to be chosen, which was always the goal. The best part is that it’s a commitment every woman can make regardless of her marital status. We just launched the Propose Too initiative, what are your feelings towards women taking the initiative to propose? I love this initiative. It is so important, and so aligned with our mission of empowering women. 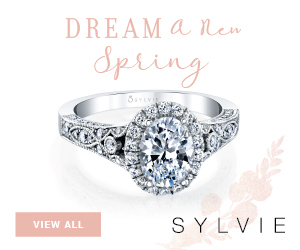 Who said only a man gets to propose? Women deserve to be at the helm of their major life choices, and men deserve to enjoy the pleasure of having someone propose. It’s a win-win in both directions. Elevating women and giving women more power and choice elevates everyone around them. That’s a statistical fact (ask Melinda Gates, who just started a $170 million dollar fund to promote women’s equality because of the impact women have on their communities). 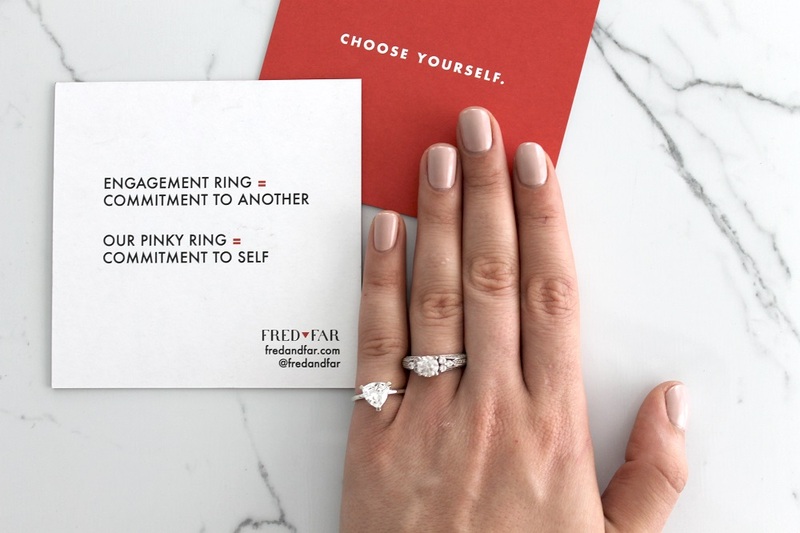 A few months after we launched Fred and Far, a woman from the UK reached out to me and let me know that she had proposed to her boyfriend and now wanted the Self Love Pinky Ring to be her engagement ring. I thought that was so cool. Not only did she propose to him, she wanted self love to be a core part of their commitment to each other. I’m excited to see this trend continue and am excited to be part of it. For more info on Fred and Far and start browsing for your pinky ring, click here.